It's never too early to get your little ones started on the road to success. Luckily for us, New Jersey-based Becky Rodriguez of Etsy store dirtsa studio has created some badass baby bibs which are perfect for getting them off on the right path. They are fashioned after two of the most beloved jabots, aka collars, of the "most fashionable U.S. Supreme Court Justice," Ruth Bader Ginsburg. The first one is inspired by her all-time favorite, a woven lace one with white beads from Capetown, South Africa. The second is modeled after her golden, armorlike collar, the one she wears when issuing dissents. 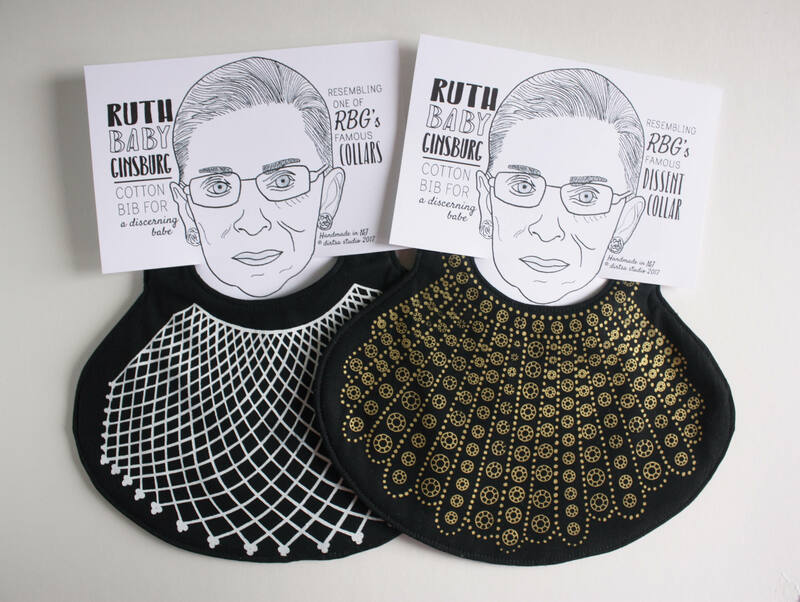 Rodriguez calls her cotton screen-printed creations "Ruth Baby Ginsburg" and they are available for $16 each or both for $28. Urban Dictionary attempts to incorporate Kavanaugh's definition of "Devil's Triangle"
A "Devil's Triangle" is a widely used term for an act of sexual congress between two men and a woman; but during his hearing, Brett Kavanaugh nonsensically insisted that this was some sort of drinking game.